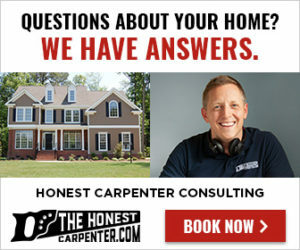 Inevitably, wooden corners in and around your home will get chipped and damaged. 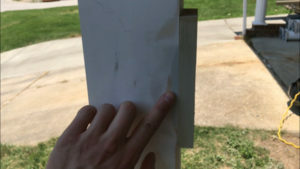 While common wood filler may work for repairs inside your home, exterior repairs often require something that will stand up to the elements better. 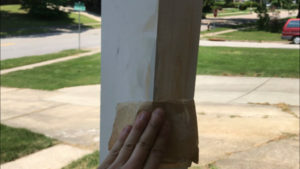 This article and video will show you how to rebuild gouged and damaged wooden corners with the most popular exterior-grade epoxy on the market–Bondo! As mentioned, Bondo is the epoxy that I find most reliable for exterior repairs. It sets up quickly, is fairly easy to work with, and is completely impervious to rot! 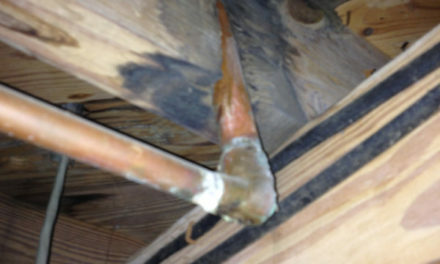 Please Note: this article does not directly address patching rotted wood. That process can be a little more involved. I’ll cover it soon, with recommendations on how to address different rot situations! Use a form block to help shape the patch. Shaping a corner freehand can be tricky. Too much force, or a clumsy move, can cause the corner to fold or dent. For that reason, I like to use a “form block” to help create a sharp, straight corner. 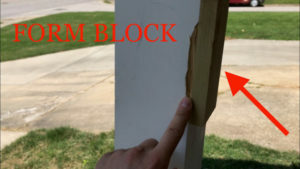 A form block can really be any straight piece of wood. (I’ve used a piece of 1×4 in the example above.) You just want the piece to be longer than the damaged area. Hold the piece flush with the damaged face and secure it into place. 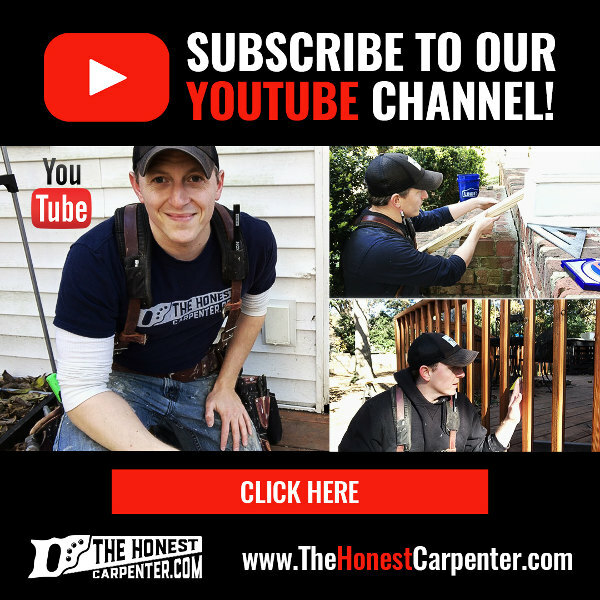 You can use clamps if you have them–just make sure that they still leave room for you to work. Screws will also do in a pinch, but make sure you pre-drill first. I attached my form block with brad nails, which I can easily pry out later. The tiny, left over holes can then be filled with caulk. 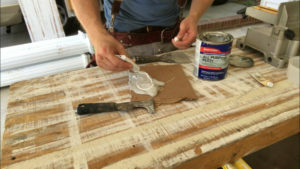 Transfer Bondo onto mixing surface. Bondo is a two-part epoxy. When the parts are mixed together, a chemical reaction occurs and the mixture begins to harden. The product has about a set-up time of 5-10 minutes (depending on heat and humidity), so once you mix, you need to move quickly! Scoop a blob or two of the putty out of your container with a 1″ putty knife, or a 5-in-1 painter’s tool. Scrape the putty onto a flat mixing board–I like to use a piece of thick cardboard with a straight edge. Now, open the tube labeled “cream hardener” and squirt a couple lines of it on top of the Bondo pile. Squeeze hardener onto unmixed Bondo. There’s no clear rule for how much hardener you should use per volume of putty. Just “stripe” the surface of the pile. But remember, too much will cause the mixture to set up very fast–too little might prevent it from setting up at all. So, I tend to err on the side of too much, when in doubt. Swirl the two parts together with a sturdy stick. I’ll often use a long exterior screw. Mix Bondo putty and hardener together. You’ll see the putty take on a slightly lighter color. Stir until the two components are completely mixed together, with no visible globs of hardener left. 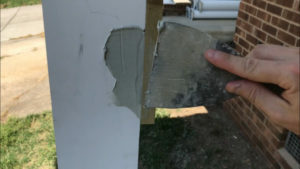 Trowel Bondo into gouge with 3″ taping knife. Use a 3″ putty knife to trowel the mixture into the gouged area. Try to load a clean “line” of putty onto the edge of your knife by pressing the tool into the putty and dragging it away from the rest of the pile. Press the majority of the mixture on the knife straight into the gouge–you want to fill it up thoroughly to prevent bubbles below the surface. With the body of the gouge filled, trowel some more epoxy across the surface, then scrape the excess off. For the first coat, you just want to get the patch started. So, don’t worry about getting it perfect. 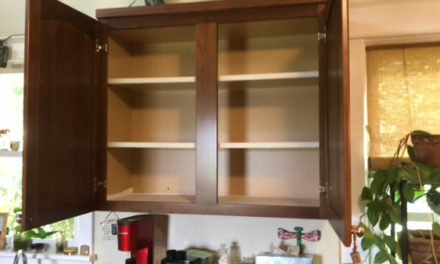 Just fill the hole and leave the area as clean as possible. Sand first coat of Bondo. 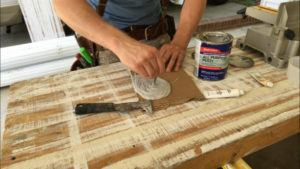 With the form block still in place, sand the area with an orbital palm sander, using a 120-grit pad. Don’t overdo it. Just get the excess epoxy off the surface, so there are no raised areas. You can sand right over the form block as well. This will help ensure a flat finish out to the edge. Apply and sand second coat. Repeat the process with a second coat of epoxy. This time you want to focus on filling in all the little uneven areas on the surface of the gouge. You can mix far less epoxy in this case–probably just one small blob. You can also leave the troweled area slightly thicker. This will create some excess material to be sanded down, ensuring that there are no voids left on the surface. Sand once again with 120-grit, moving the sander around in a soft, circular motion. Give a little additional pressure to the raised patch. You want to knock it down first so that the sander doesn’t scuff the surrounding areas too badly in the process. 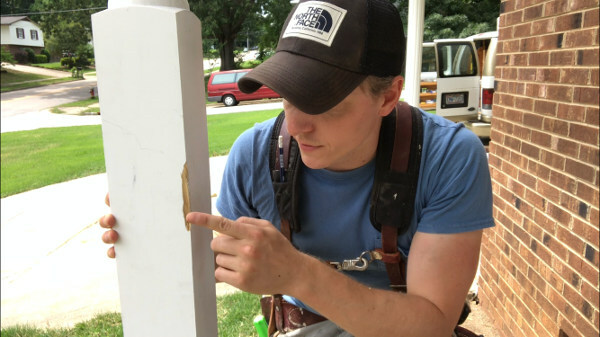 Before you attempt to remove the form block, use a utility knife to score a neat, straight line between the block and the repaired patch. Let the block guide the tip of the blade. This will help ensure that the block comes away cleanly. With the line scored, you can now remove the block. If it is clamped or screwed into place, then simply release the clamps or back out the screws. You may have to rotate the block a little bit to get it to separate from the patch. 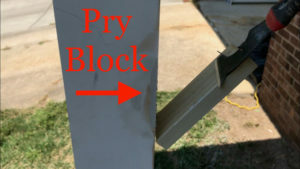 If you attached the form block with brad nails or trim nails, use the 5-in-1 tool to pry it away from the wood surface. 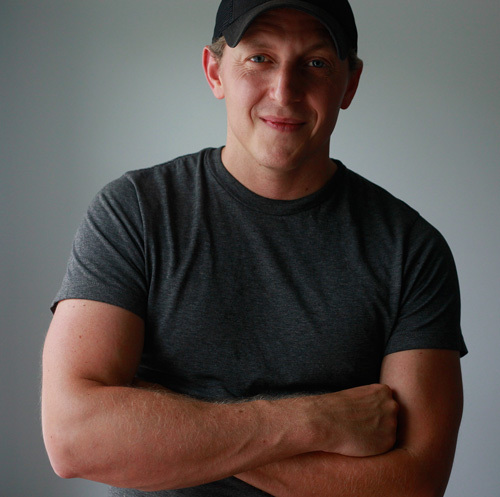 Just be sure to pry gently–you don’t want to cause a new gouge! Sand the other face of the corner lightly with the palm sander. If there are tiny bubbles or divots in the patch on that side, you can often just fill them with a bit of siliconized caulk. Every now and then you might have to apply another tiny amount of epoxy to this surface to get it smoothed out. But typically a simple sanding is all that’s required. Switch over to a hand-held piece of sandpaper (220-grit) to lightly sand the sharp corner of the patch. You just want to soften it a little so that it will hold paint better. That’s it! 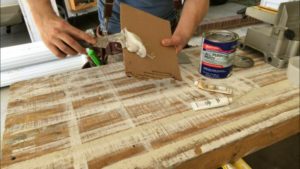 When fully cured, this Bondo patch will be even more durable than the wood around it. 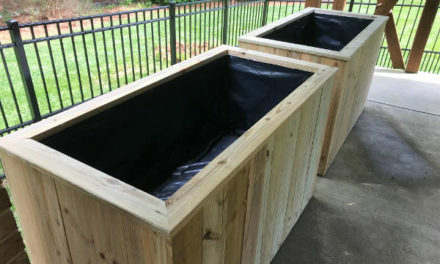 Just be sure to prime and paint the repaired area fully, especially any spots where you sanded down to fresh wood. As mentioned, in the future I’ll tackle repairs on rotted wood. 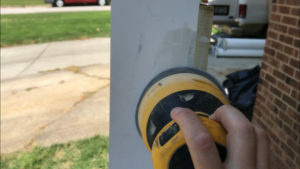 But the repair detailed above should serve well nearly all gouges, dents, and divots you’ll find on the wood trim around your house. *Also, you can use acetone products to clean the excess Bondo off your tools. Nail polish remover is the most common household form of acetone. Just wipe some onto the tool and let it sit for a while. After that, you should be able to scrub the epoxy off. Check out this link for more info on the use of acetone as a solvent, including its low environmental impact.